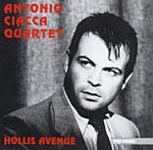 Italian pianist Antonio Ciacca’s modern mainstream quartet session breathes dramatic fire and still contains the necessary dollop of lyrical charm. 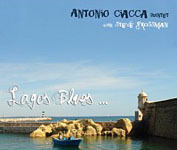 Thirty years old, favoring Thelonious Monk’s compositional spontaneity, and aware of the need for balance in one’s work, Ciacca leads two different quartets through several standards and a few originals. Young lions all, the artists dish out tributes to Monk, Duke Ellington and Billy Strayhorn while applying fresh ideas throughout. The album’s title pays homage to Jaki Byard. The pianist, who died February 11th, lived on Hollis Avenue in Queens, New York with his two daughters. Ciacca, a student of Byard’s, had paid the elder pianist a visit only one week before the unexplained murder. Ciacca’s teachers, including Steve Grossman, Kenny Barron and Barry Harris, have prepared him well for the art of improvising at a piano’s keyboard and leading others with exciting counterpoint. Brian Hoberon, Azhi Osada and Marcus Baylor work well with the pianist throughout with the lead voice coming primarily from tenor sax and piano. Both provide confident and fluid lines with an unbridled imagination. There’s an alternate take of "Norman" at the end of the album that turns bass and drums loose. Markus Trikland, Brandon Owen and Tommaso Cappellatto are all students at The New School in New York. Their approach turns out rougher, more natural, and with less polish. I happen to enjoy that. However, the noticeable contrast simply means that Ciacca works with different artists in different situations with a different sound. His piano work, the product of a lifetime of devoted jazz study, shines brightly as a star in the sky, leading the way to a positive future for a young man who follows his dream. 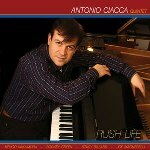 Personnel: Antonio Ciacca: piano; Brian Hoberon: tenor saxophone (1-3, 6-7); Azhi Osada: bass (1-3, 6-7); Marcus Baylor: drums (1-3, 6-7); Markus Trikland: tenor saxophone (4-5); Brandon Owen: bass (4-5); Tommaso Cappellatto: drums (4-5).